British Prime Minister Theresa May has been accused of doing a ‘sweetheart deal’ with a Conservative council in one of the wealthiest parts of Britain to stop them raising taxes by 15 percent. Labour leader Jeremy Corbyn made the allegation at Prime Minister’s Questions (PMQs) on Wednesday afternoon, where he produced leaked text messages apparently from the leader of Surrey County Council to a central government civil servant. Surrey Council had planned to hold a referendum on whether to raise the local tax to cover the cost of central government cuts to social welfare amounting to £170 million (US$213 million). However the vote was canceled abruptly at a meeting on Tuesday, after the council leadership changed its mind and instead approved a 4.99 percent increase. Corbyn suggested the government gave Surrey Council a special deal because Health Secretary Jeremy Hunt and Chancellor Philip Hammond both represent constituencies in the county. Surrey is one of the richest counties in the UK and represented solely by Tory MPs. 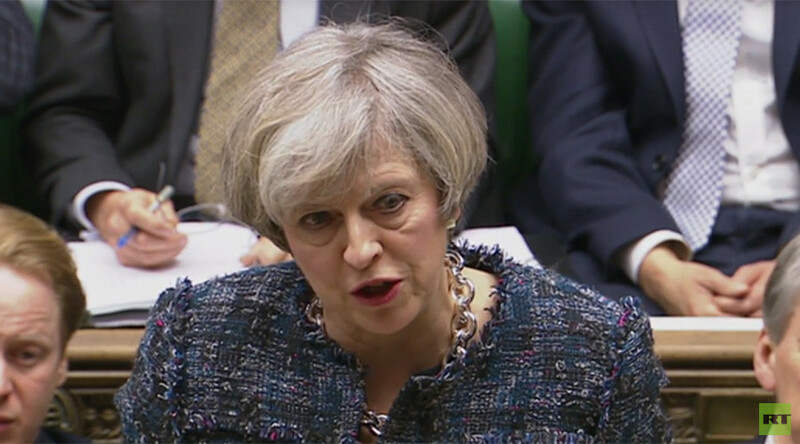 “My question was whether there’d been a special deal done for Surrey – the leader said they’d had many conversations with the government,” Corbyn pressed May in the House of Commons. “We know they have because I’ve seen leaked copies of texts sent by the Tory leader David Hodge to someone called ‘Nick’ who works for ministers in the Department for Communities and Local Government (DCLG). The Independent reports the text messages appear to have been leaked after they were accidentally sent to a Labour politician called ‘Nick’ instead of the civil servant of the same name they had been intended for.